Godfrey Mawaa worked with Samaritan’s Purse as the water, sanitation, and hygiene program manager in Tana River, Kenya. From a distance, birds could be heard calling deep into the forest. Crickets chirped, and the crunching of leaves became louder from our laden footsteps. The enormous canopy of indigenous trees covering the sky amazed us. The chairman said we were in the dense part of this Kenyan forest. 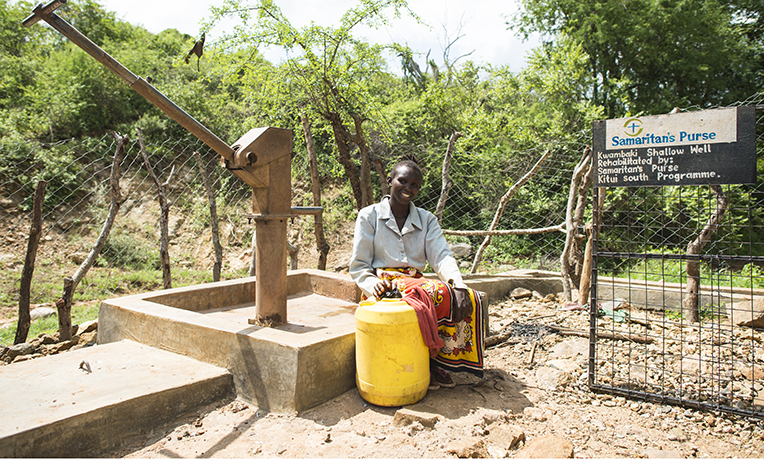 The new borehole will provide people like these with fresh, clean water much closer to their homes. I was on a trip to survey the most appropriate route for the proposed Shika adabu borehole water project. It was one of the three borehole projects that we were working on. Samaritan’s Purse conducted a test pumping to determine the borehole’s yield. The borehole was approximately 3 kilometers from the village on a long, winding path in treacherous terrain. It’s the only permanent water source that serves the village, and flooding normally cuts it off during the rainy season, forcing people to consume contaminated water. We planned to equip the borehole with a solar submersible pump and to lay a pipeline to supply water to the village. We met with the community to come up with a design to guide us in the project.